Electronic-programmed circular saw with +/- 46° double blade tilting. Additional freight charges may apply to heavy or oversize items. Your shipping options could include local delivery, customer pickup, or we may quote freight delivery services to locations out of our shipping area. Shipping fees are based on the destination, size and weight of your item. Call us at 1-800-268-0942 toll free, to speak with a McFadden's Customer Service specialist. Finally available at everybody’s reach. With powered and programmed sawblade movement available as standard. Circular saw with ±46° double tilting. 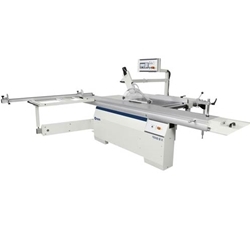 It allows simultaneous use of a 400mm saw blade and 160mm scoring blade both for 90° cutting and ±46° tilted cutting, guaranteeing the maximum cutting height on veneered panels and solid wood. Unrivaled cutting finishing Sliding Table: Optimal support also to larger pieces, with the new sliding table 360 mm wide. Exceptional precision and smoothness: to secure the guides it is not used glue, since the thickness could affect sliding. They are secured with a procedure of aluminum riveting. Double tilting at everybody's reach Saw unit: New saw unit with a stiff cast-iron structure which can accommodate a blade of 400 mm diameter with scoring blade mounted. It ensure a perfect and easy cutting of veneer panels and thick solid wood material with very high thickness both at 90° and tilted cuts at ±46°. The saw blade uses 100% of the motor power, thanks to the scoring blade with an independent motor as standard. READY: the practical advantage for automatic control of the main positions: The programming of the work becomes simple and effective with the electronic control with a 4” LCD colour screen. Ready 3 / Ready 3 UP Automatic positioning of the parallel fence, from “Ready” control (3 axes): Programmed or manual fence movement with a hold-down drive for the maximum versatility. In addition the Ready 3 UP version has the control on the mobile control panel. The SCM Group North America offers distribution in Ontario, Canada for the largest ranges of the best industrial woodworking machinery available in the industry. Whether you are small shop or a large corporation, build kitchen cabinets or architectural millwork, we focus on your individual production requirements to make sure we provide the best solution possible. We are experts in complete and integrated manufacturing facilities as well as individual machines like CNC Wood Routers, CNC Machining Centers, Edgebanding Machines, Panel Saws, Bore and Dowel Machines, Wide Belt Sanders plus an array of single and multi-purpose machines. The Premium division Minimax offers professional machines, sturdy, compact and user-friendly. Minimax machines easily work any type of wood or its derivatives and guarantee lasting top quality and reliability. From universal combined machines to single-function machines, minimax offers a huge range of products designed to prioritize safety and to protect less expert operators. ** Leasing Terms: To qualify for a lease you must be approved OAC (on approved credit), price reflects 5 year lease with 10% buyout + tax. Leasing is available on all Minimax equipment models to qualified customers. Some conditions apply. Contact McFadden's customer service or your sales representative for complete details.